There’s always been a few Hulks running around the Marvel universe, but in the wake of Bruce Banner’s death in Civil War II, there’s now one more joining Amadeus Cho and Jen Walters—and, true to form for a character in a series called U.S.Avengers, he’s suitably patriotic. When U.S.Avengers was first announced, many reasonably assumed that the Red Hulk that is part of the stars-and-stripes team was the man who’s used the identity since it was first introduced: long time on-and-off Hulk antagonist Thaddeus “Thunderbolt” Ross. But when we’re introduced to the team in today’s U.S.Avengers #1—by Al Ewing, Paco Medina, Juan Vlasco, Jesus Aburtov, and Chris Eliopoulos—we learn that a new person has taken on the mantle: General Robert L. Maverick. Filling in the audience through the conceit of a video profile, Maverick reveals that following Mutant billionaire Roberto da Costa’s rehaul of AIM into Avengers Idea Mechanics during the recent New Avengers series, SHIELD and AIM have collaborated to form the American Intelligence Mechanic—a new high-tech research organization that mixes da Costa’s money and manufacturing with the spy-fi tech of SHIELD, backed by a new team of Avengers, and oversight from the American military through Maverick. 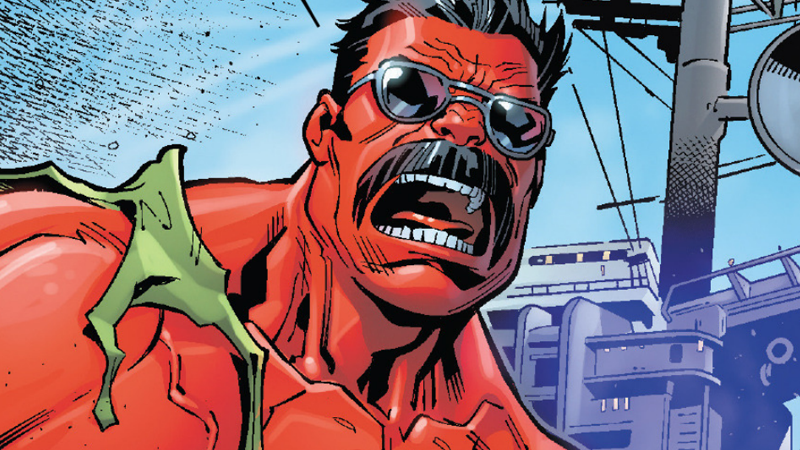 So how does Maverick suddenly find himself able to turn into the Red Hulk? Thanks to a piece of SHIELD technology dubbed “the Hulk plug-in”—an embedded device that, when matched up to someone with a suitable genetic profile like Maverick, allows the user to be genetically enhanced into the Red Hulk. At least Maverick later admits his new catchphrase needs some work. Not exactly “Hulk smash,” is it? Like, punching your way straight through a Helicarrier/Volcano base style cool stuff. That’s some good stuff, General.